Why do some kids have to wear a retainer? Today’s Wonder of the Day was inspired by teagan from AL. teagan Wonders, “how come most people have to get braces” Thanks for WONDERing with us, teagan! Do you have braces? If not, chances are that you know someone who does. If you don't have braces right now, you might need them one day. Different kids feel different ways about braces. Some kids can't wait to get them, because they think they're neat and know that they'll give them a better smile eventually. Other kids worry about how braces will change how they look or that they may be uncomfortable. There's really no reason to worry about braces, though. They're just tools that special dentists — called orthodontists — use to correct the alignment of your teeth. Unfortunately, not all teeth grow straight. It's not your fault. There's nothing you can do to make them grow straight. They just grow how they grow and, if they aren't straight, you may need to see an orthodontist to find out if you need braces to straighten them out. Years ago, braces were made of thick metal that was very noticeable. Today, though, braces are much more advanced than in the past. Although they're usually still made of metal, the metal is thinner and smaller. Sometimes you can get braces that are clear or the same color as your teeth. They even make braces that go on the back side of your teeth. With these advances, braces aren't nearly as noticeable today as they used to be. Of course, if you want to be noticed, you can be! The rubber bands that come with braces can now be found in all sorts of wild and crazy colors. You can now make a fashion statement with your braces! But what do braces actually do to your teeth? The metal wires put steady pressure on your teeth to move them slowly over time to where they're supposed to be. The rubber bands help to adjust the alignment of your teeth. Working together, the wires and rubber bands straighten your teeth and line them up the way they're supposed to be. How long you have to wear braces will depend upon your teeth and how much realignment they need. Most kids have to wear braces for only a couple of years or so. After you get your braces off, you may have to wear a retainer for a while. A retainer is a hard plastic mouth guard that makes sure your teeth don't go back to their original places. After a while, your teeth will settle into their new locations and you'll be able to ditch the retainer and smile about it! While you have braces, it's especially important to make sure that you take good care of your teeth. All that metal and rubber in your mouth can make it easy for food to hide in places you'd normally be able to clean easily. If you have trouble cleaning your teeth, talk to the orthodontist. There are special tools available that you can use to make sure your pearly whites stay pearly white! Do you take good care of your teeth? Ask any dentist — keeping your teeth clean is an important step to staying healthy. In fact, when's the last time you saw your dentist? If it's been more than six months ago, ask an adult to make you an appointment for a check-up. Seeing your dentist regularly is an important part of keeping your teeth strong and healthy! Do you know how to brush your teeth properly? It might seem like a no-brainer, but there's actually a correct way to brush to make sure you get all of your teeth as clean as possible. To learn more about the correct way to brush your teeth, jump online and check out the Step-by-Step Directions for How to Brush Your Teeth. Even if you know how to brush your teeth properly, sometimes you forget. Life gets busy, so it's easy to do. If you want an easy way to keep track of your brushing, download and print out this handy Get Up and Brush Chart! You should also ask an adult to keep you accountable by reminding you to brush your teeth after every meal. I loved this article and it was so informing on braces. Great job once again. Thanks, Abigail! Do you have braces? Hi, nic! 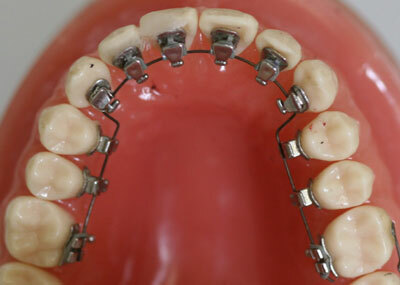 Braces are used to help correct the alignment of your teeth! We're sure your smile is wonderful, nic! But if your orthodontist says that you need braces to help your teeth alignment, you are not alone; many kids need braces! We are so glad that you found this Wonder helpful, Abby! Thanks for WONDERing with us! I have braces and I can already see my smile getting so much better! I am so thankful for them! Thank you for sharing your connection to this Wonder, Abigail! Did you guys know that people can have star/heart brackets? We did not! That is so interesting! Do you have heart or star brackets, Abby? No I don't, my orthodontist doesn't have them but that would be cool!! We think so too! We're glad that you shared this information with us! Thanks for sharing, VGJ! It sounds like you have learned a lot about both expanders and braces! It's important to take care of your teeth, and Wonder 266: What Happens If You Don't Brush Your Teeth? can help explain why! Good guess! What else did you learn from the article, Pippa? We think kids need braces if your teeth are growing wonky because otherwise you wont have healthy teeth when you are older. Great thoughts! Were you correct after you read the article? What's up, Jaydem? How did you like this Wonder? I will have to get braces in a couple of years, i'm kind of excited and kind of not. I'm also getting braces but in a couple weeks, I cant wait to chose what color. Thanks for sharing your connection! Does she like having them? Are there certain foods she can't eat? What's up? How did you like this Wonder? Do you have braces? Do getting braces hurt ?! A little, at first. But you get used to it and most people feel it is worth it to have nice straight teeth for the rest of their lives. Thanks for WONDERing with us! No they don't! I have them also! They kind of hurt though. They definitely aren't fun but it will all be worth is one day when you have an amazing smile like this one: 😃 ! Hang in there, Dod! I'm getting braces on August 5 2016!! Which means tomorrow! And i'm a little nervous. I am getting braces I can't wait!!!! It is very nice to read the blog about teeth braces because mostly small children are having the braces for their beautiful smile which a well shaped teeth can give. Me and my friends in my class made are own wouderopolis on kid blog it's under krupps class. My friend Alexa had her braces in her top teeth just like the boy in the video. I think getting braces will be excellent! What happens if you do not put on braces and do you have to? Hey, wonderopolis. I might need braces, but I hope I don't get an expander because I don't want my mouth to look big. Hi wonderopolis. People get braces because their teeth are not straight and after you have braces for 1 year, then you will have retainers. You can get retainers on the top of your teeth or can be on your teeth. I think braces are COOL. My cousin had braces and retainers and she still has them. Have a fantastical day. Do you have a wonder about Candy Land? I always win. I always wanted glasses and braces they are so coollllllllllllllllllllll. The video was awesome and I love wonderopolis. I think the next one is about a chihuahua. Just a random guess. Have a good day. Is there a wonder about popcorn????????????? Hi. I love you website. It is so cool how you come up with a wonder everyday! I especially love the wonder for today! My mom thinks I need braces but my dad says they will turn out straight with no braces. I kind of believe my mom because I barely get to see my dad, so I doubt that he knows, lol. That was an awesome wonder, hope your next wonder is as wonderful as this one. It's been a long time since I posted anything on Wonderopolis. When I saw this wonder I got really excited because I've had braces. I think that I got the worst of it, though. I had to wear a face mask at night, a pallet expander with irritating hooks and braces. All for just 4 teeth! I'm sure glad that's over. Anyways, thanks for posting a wonder like this I learned a lot! :) P.S Because the school year is coming to a close, I just want to say that soon there will be 5th Grade LEAPer: Allison! I know! Braces are something that straighten your teeth! I think tomorrow's will be... SECRETS. Shhhhh. Don't tell anyone I said that. ;) Have a WONDERopolis day! My mom thinks I need braces. P.S. Do you have any wonders on aliens? Is there a wonder about eyelashes? I've always wanted braces and I'm 7. Hey! My sister has those things, too! Have a nice day!!!! Mommy said I might need to get braces. Thanks for sharing your personal connection to today's Wonder, Bradley! We like your question about braces, too, Bailey! Braces work by slowly putting pressure on your teeth in a way that sort of tells them, "Hey! Straighten up!" There is a wire that hooks all of the brackets on the teeth together. The orthodontist tightens that wire (or even changes it to a different wire) to help him tell the teeth how they need to move! :-) We appreciate you and your classmates exploring Wonderopolis together! There is this game called minecraft and it is really cool. You guys would like it. I learned that braces make your teeth straight. (Liam) My cousin has braces. Pink and green. (Evan) My brother might get braces because his teeth are not straight. (Myleigh) Bye Wonderopolis! For me, my braces didn't hurt one single bit!! My orthodontist says that some people say they do and some say they don't. Mine didn't! I think tomorrow's wonder will be about compasses. Is there a past wonder about pickles????? They need braces because their jaw is crooked. Kids need braces because they need their teeth fixed. I Knew it!!!! Oooah, yeeaah!!! I already knew why kids needed them. I had some when I was 14. Hi, Wonderopolis! We rated today's Wonder of The Day for the first time! We gave it a 5 star! We're going to start rating each Wonder of the Day we read as a class. Is tomorrow's Wonder about airbags or who invented the first off-road vehicle such as a Jeep? Another student thinks it might be, Why do airbags have such an impact? Have a WONDERful day! 2nd WONDER comment: I also think they hurt, in a few weeks I'm going to get some braces on my top set and bottom set :) :( ! Wish me luck! So they can have a strait set of teeth, some just want it because they think they are cool. AWESOME! So me and my mom were talking and we thought this would be a good question for Wonderopolis. Who holds the record for the tallest person? How do you not feel it when the braces are pushing on your teeth to make them straight? Do you know anyone with braces? I do want to get braces and I also don't, because I want straight teeth, but I don't want it to hurt after they put them on. I don't know because my brother said that after they put braces on him it hurt really bad. SO I DON'T KNOW WHAT TO DO????? Thank you! This wonder became helpful because this summer I'm getting braces, and I was very worried. My teeth are actually straight, but I have a split between my teeth. Do they have zebra print braces? I love zebra print..today I even wore my zebra shirt!! [; hehe..
Hey Wonderopolis. I really like this wonder of the day. Soon, about in the summer time, I will have to get braces. I have a tooth that went through my gums so I will HAVE to get that fixed. People make fun of me because my tooth sticks out and isn't normal like other people's teeth. It makes me sad. But I just try to go along with my life. Why did the kid have braces? I was right again! This time I don't know what tomorrow's wonder of the day is about. Maybe compasses? Oh, and first comment! Ummm we all know ur not the real wonderopolis. After you get your braces off, what might you have to wear for a while? If you need braces, you’ll need to see what type of special dentist? Braces are usually made of which material?